Bowhunters will surely like the Bushnell 202442 The Truth ARC as it comes equipped with features that cater to their needs in particular. That said, this doesn’t mean that this model from Bushnell is not fit for other hunters, as well. The Clear Shot technology, along with the ARC feature, make this particular model a winner in many users’ books, as it provides excellent accuracy, along with high overall performance. The vertical operation makes it convenient, too, and you might find that your skills as a hunter receive an extra boost when you’re using the Bushnell 202442. Let’s see what makes this rangefinder such a great option. The magnification on this model is 4x, so it is not the greatest, but the manufacturer compensates by giving this model a huge 850-yard range, something that you usually find on much more expensive rangefinders. It works with CR2 batteries, and the required one to work out of the box is included. The diameter of the objective lens is 20mm, so that is pretty standard for this type of product. What makes it so great is the number of features included that make hunting a delightful experience. With a range that goes from 7 yards to 850 yards, the Bushnell 202442 doesn’t have to worry about the competition. Of course, the longer end of this scale applies to highly reflective objects, but, still, for anything else, you get a substantial 600-yard range, while for deer, you can expect to calculate distances fast and easy up to 200 yards. The accuracy on this unit is outstanding, as well, and within just one yard. Besides excellent range, this model also offers some attractive extra features that make it a pleasure to use. The ClearShot function will give you clearance for a shot in an instant, so you can get that clear line of shot without worrying about obstacles in the way. Calibrating the feature may take a little time, but the results will be outstanding. Another great feature that will enthrall bowhunters is the ARC – angle range compensation. Uphill or downhill shots will no longer be an issue because you will get a clear idea of the distance between you and your target. The model also comes with what is called a Bow mode that gives you clear information on the correct horizontal distance between you and your prey for distances up to 99 yards. All these extras make this particular model a hit with bowhunters everywhere, and that is why it is highly recommended for those who prefer a bow as their hunting weapon. The model comes equipped with high-quality optics that provide HD performance. While the magnification is only 4x, the overall results you get when looking through the rangefinder are enough to justify that this model delivers as far as optics are concerned. The 20mm lens diameter manages decent enough light gathering abilities so that you can still see even when the lighting conditions are less than ideal. Although the Bushnell 202442 is not 100% waterproof, its casing is rainproof, which means that splashes of water or the natural moisture that occurs when the skies are pouring, and you’re out in the wild will not affect the delicate mechanisms located inside. You can securely take this rangefinder with you when it’s raining, as it will encounter no issues. The casing is also durable and has a non-slip texture that makes this model even more convenient to use in less than ideal weather conditions. It is essential to take a look at what extras are included with your purchase when you go shopping for a rangefinder. In this case, you get a carrying case, a neck strap for convenience, and a CR2 battery. Seeing how the latter are not that common, it is quite thoughtful of the manufacturer to include the required one. 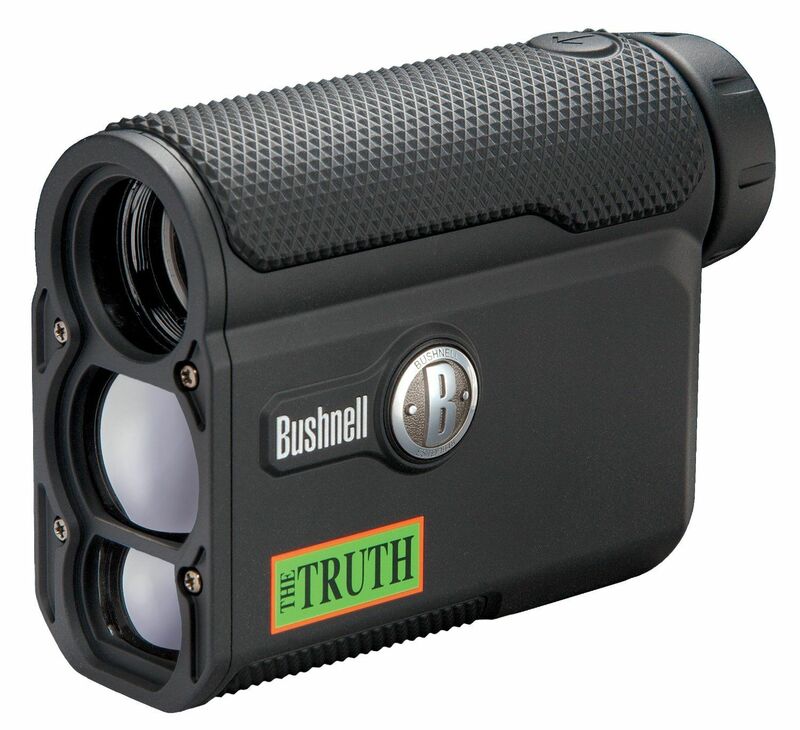 An impressive sum of benefits and features recommend this model from Bushnell. As expected, the optics on this model are superior, and you will get crystal clear images when you’re using the unit. As a rangefinder, it has excellent range, accuracy, and speed, but what matters most is that it comes equipped with superior performance features. The ClearShot technology, as well as ARC and the unique Bow model, allow hunters to get the most accurate line of shot and achieve the results they want without any troubles.